If you missed it when it was shown on the telly you can watch it here. It's at 10.50, about half way through. Submitted by stephen on April 27, 2012 - 18:52. With Easter, it was another quiet Sunday in the boatshed. More joinery work on the seats continue, with the mitre saw in use to get the seats and supporting beams to fit the curve of the boat. Submitted by stephen on April 19, 2012 - 22:04. After the excitement of the previous few weeks and with Easter approaching, this was one of the quietest sessions with only Rob and Dave MacAulay in the shed on Sunday. The first thwart (seat) is now ready to be fitted. Dave and Dorothy Ramsay have very generously pledged to give a significant offering to the project from the proceeds of the sale of their boat. 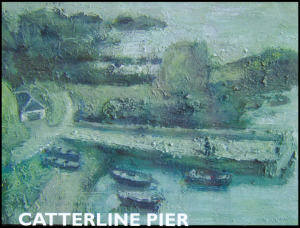 Dave has also offered to add the Catterline Rowing project to his application for local heritage funds. We have just about enough funds to finish the building of the boat. However we still need funds to complete the project. In particular we need to buy safety equipment (VHF radio, lifejackets) and a trolley and cover for the boat. Submitted by stephen on April 19, 2012 - 22:03. We were honoured this week by a visit from STV News. The presenter Fiona McIlwraith spent most of the afternoon talking, filming and interviewing boat builders. She was curious about what motivates a group of individuals to come together to build a community boat. With a knowledge of boats she seemed to enjoy her time in the boat shed and is keen to film the launch. She will let us know when her piece is due to be screened. Despite the distractions of a TV camera, the first strip of the inner gunwales (bit of wood at the top of the side of the boat) was glued on the starboard side. The port side having received its one in a mid-week operation. The wood for these are leftovers from the building of Rob's boatshed. The gluing of the gunwale required the use of all the clamps (around 25) in the shed, much to Brendan Hall’s frustration. He had to find another way to secure the piece of wood he was planing. Nursing the frustration of a damaged motorbike, Stephen Hall did a splendid job putting a D section onto the strips of oak that he had previously cut for the outer gunwales, with a hand plane. Brendan finished these up with sandpaper to leave some fine pieces of timber. Submitted by stephen on April 19, 2012 - 22:00. Have you finished with that noisy thing? The first task was to get the boat sitting properly on its chocks. Rob, Tim and Chris spent a while fiddling around with ever smaller chocks to ensure that the weight of the hull was taken through the keel and then that the hull was level. Work entered a new phase with the start of some of the more fiddly joinery work. The thwarts will be a challenge to get a snug fit. The curve of the planks both horizontally and vertically require some careful measuring and cutting. 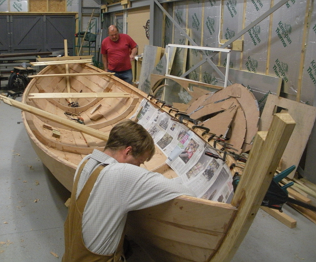 Preparation of the gunwales began. This involved quite a lot of stock removal. Nick offered to use his electric plane. But was only allowed to on the condition he did it outside the shed. At tea, he was met with the comment, “ Have you finished with that noisy thing?”. Fortunately there had been a realisation that the inner gunwales could be completed with two thicker strips. The plans show three strips with the middle strip made up of alternate pieces of wood and gaps. This looks good, but is quite a bit of extra work and avoids the use of noisy tools, so there was agreement to go for the alternate option. Submitted by stephen on April 19, 2012 - 21:58.